Just a few more days before it's time to take back the Last City, Guardians. Destiny 2 launches September 6 on PS4 and Xbox One, giving fans and newbies alike plenty of bad guys to shoot and loot to collect. But the biggest and best of you aren't going to be satisfied with the base content, and you want to know when you can take on the toughest challenges Destiny 2 has to offer: Raids, Trials, and Nightfall. Friends, we are here to help. When does the first Destiny 2 Raid go live? September 13, one week after the base game launches on PS4 and Xbox One. Make sure you're ready, because things kick off at 10am Pacific / 6pm BST. 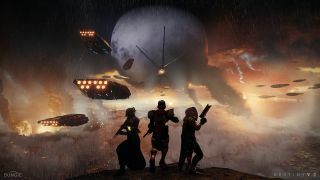 What is the first Destiny 2 Raid? There's no official word on what the Raid will be called or what it's about, but leaks refer to it as "Leviathan." Concept art shows what looks like a Cabal-built superweapon that could certainly fit that name, though anything beyond that is speculation at this point. When does the first Destiny 2 Trials of the Nine go live? September 15, 10am Pacific / 6pm BST. What is Trials of the Nine? In the original Destiny, these were called "Trials of Osiris." It looks like Destiny 2's first DLC will focus on said Egyptian-named space wizard though, hence the name change. Prove yourself as a particularly tough cookie in Destiny 2's PvP modes and you'll be able to participate in the Trials, earning yourself rare rewards. It's basically to PvP what the Raid is to PvE. When does the first Destiny 2 Nightfall go live? Launch day. There is no wait on Nightfall. The Nightfall is an extra-difficult Strike, played with modifiers (such as extra damage dealt while airborne or no radar) turned on to change how the game is typically played. There is no standard matchmaking available for the Nightfall, so just like a Raid, you'll need to form your own team. It changes week to week as well, so you won't be doing the same Strike with the same modifiers. As you would expect, completing the Nightfall means bonus rewards.